When is an Airgun Better than a Real Gun? This is not to say that a “Real Gun” is not as good as an Airgun or better in other ways, in this video I’m just pointing out how an Airgun in some cases can actually be better suited than a Real Gun. Availability: What I mean by this, is that in many countries Real Guns can be very hard to acquire and often require safety course and applications before one can purchase a Real Gun. I have no problem with this but it is a reality that must be considered. Having an Airgun versus not having a gun at all makes it a better option for people that live in countries that have strict gun laws. Here in Canada we are allowed Real Guns, even pistols but we do have restriction on our pistols and so I can only get certain guns in an Airgun version. As a collector this is better than not having the gun at all. Price to Buy: Generally speaking you can pickup an enter level Airgun for much less money than a real gun. 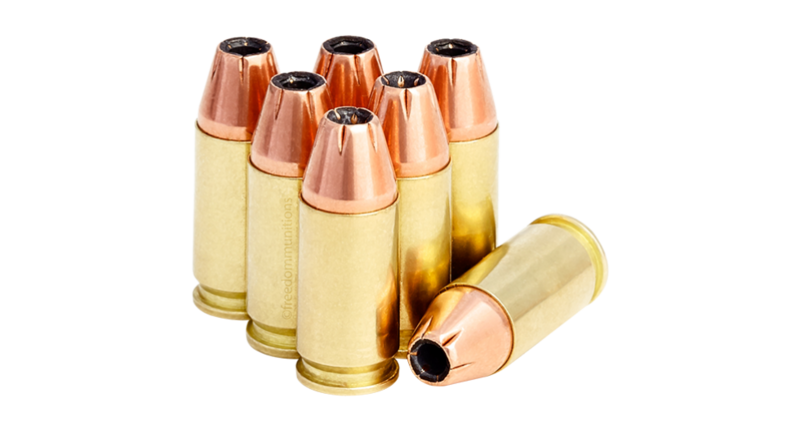 Cost to Shoot: Real gun ammo prices have been steadily increasing to the point that a day out shooting can cost several hundred dollars just on the ammunition alone. CO2 is a bit less than $1 per 12 gram Cylinder which can yield up to 100 shots each. To shoot 100 rounds of 9mm will cost close to $40 versus 100 shots of 4.5mm steel BB at around $1. For this reason alone an Airgun can make a lot of sense even for Real Gun owners looking to get more cost effective practice time. Access to Shooting Locations: Depending on where you live you will have to consider your local laws and where you are allowed to shoot both types of guns but typically you can shoot an Airgun safely just about anywhere as long as you implement some backstop safety precautions. Here in Canada we can only shoot a pistol at designated gun ranges, where as Airguns have a lot more allowances to shot them as long as you are not braking any city bylaws. 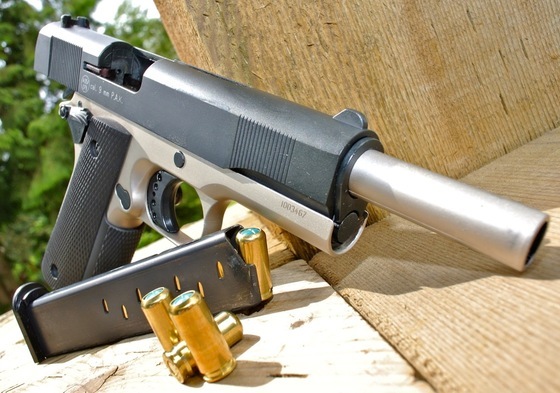 Training Guns: Even if you plan to eventually step up to a Real Gun at some point, an airgun is a great option to first learn proper gun handling skills since if you where to make a mistake, the consequences are much less severe. Airguns are also a lot less intimidating than a real gun since they are much quieter and have less recoil, you don’t even need to wear ear protection with most Airguns which means an instructor can communicate to his pupil on the range a lot easier. Prop Guns: Since Replica Airguns look so much like real guns these day, they can often be used as a safer substitute for use in Movie, TV or other Photo and Video productions. 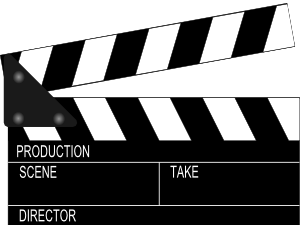 Using a Real Gun on set generally requires a certified “Gun Wrangler” be on hand as Real Guns must be transported, stored and handled using very strict regulations. Airguns generally do not need to follow the same rigid regulations that Real Guns are bound to. Tactical Training with Live Targets: Obviously shooting a real gun at a live target would not fair well for anyone involved, so that is completely out of the question. Airsoft Airguns are however perfect for Tactical Training and other weapons based simulations. All that is required for safety when using Airsoft guns is the use of eye protection and generally some heavy clothing. I am sure there are some more areas in which Airguns may have the advantage over a Real Gun but these are the main ones that I could think of. I'm getting close to uploading 600 videos now over on the Replica Airguns YouTube channel, so there are bound to be a lot of similar questions and popular discussions. In this Replica Airguns YouTube Video I address what I feel are my Top 10 Most Common Airgun Questions and Discussions. No Orange Tip On Your Airsoft Gun! Are You Insane? Whether you like it or not, most of us have come across an Airgun with an ugly orange tip on it at some point. 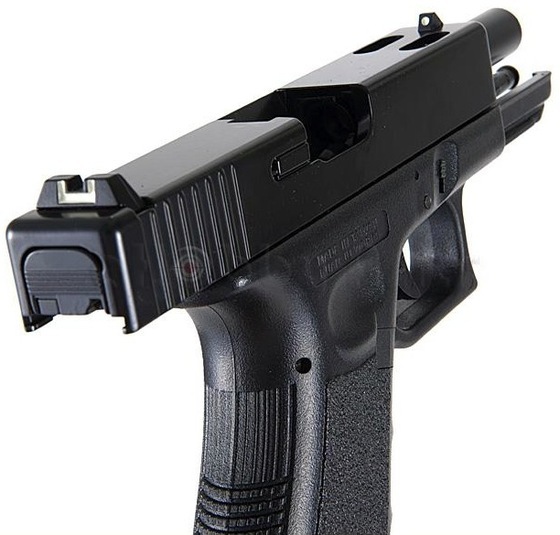 In most cases you will find the intrusive orange or red tips on Airsoft guns that shoot plastic BB's, in some cases you will even find them on Airguns that shoot either lead pellets and/or steel BB's. In Canada where I live, we used to only be allowed Airsoft guns that had clear sections as our replica gun laws are very strict and all black Airsoft guns would have fallen iinto the "replica" category if they did not have large clear plastic see-through sections on them. This clear section law was revised somewhat over the last several years to allow for all black Airsoft guns here in Canada. It was determined that many Airsoft guns with higher fps limits could cause a serious injury to a human, making them less of a toy in the eyes of the law and more of a weapon. Because of this, Airsoft guns that are capable of shooting a .20 gram plastic BB at a velocity of 360 fps or "higher" are now considered to be similar in the eyes of the law to a regular steel BB or lead pellet shooting Airgun. 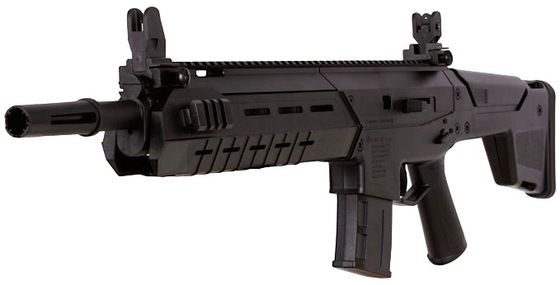 In Canada, Pellet and Steel BB guns are actually considered firearms of a sort so this allows the higher fps Airsoft guns to be all black since it can not be a replica of a firearm if it is in fact considered to be a firearm by law. 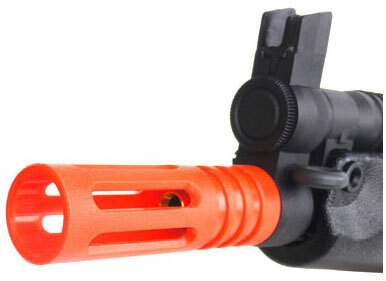 The long and short of all of this is that here in Canada we do not require our Airsoft guns to have orange or red tips since they are considered more or less to be just like any other Airgun and our Airguns do not have red or orange tips either. Getting back to the title of this article "No Orange Tip On Your Airsoft Gun! Are You Insane?" I often get folks from the US giving me heck for removing the orange tips from my Airsoft guns or asking me why my Airsoft guns don't have them in the first place. These people even state that I could get in a lot of trouble for this! Perhaps they think I live in the US or that US laws govern Canada as well? I am not sure but I can say for the record that I am not breaking any laws at least here in Canada where I live. 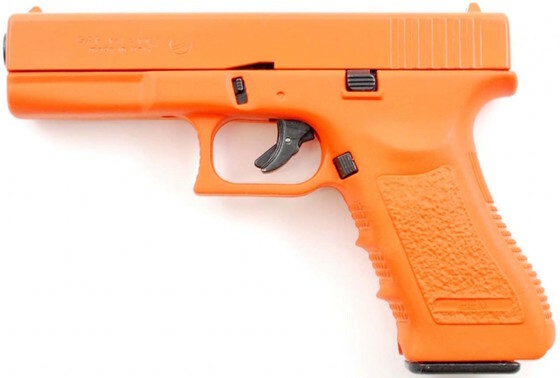 I know in the US that wholesalers and retailers by law have to sell Airsoft guns with the affixed orange tips on them, once the end user receives that gun and depending on which state they live in, it may or may not be legal to remove the orange tip. Again, you will need to look into your local state laws as they are different from state to state in the US. Way back in the beginning of 2011 I posted some video reviews on a Chinese made AK-47 CO2 BB gun I owned and also at the time sold in the Replica Airguns Store. Unfortunately I had to pull these videos off of YouTube and the Replica Airguns Website because there was a police investigation related to these CO2 BB rifles. I decided to repost these videos now that some time has gone by and the sting from this experience has lessoned for me a bit. For those of you that want to know a bit more background on the reason why I removed the videos you can read on... Without going into a huge amount of detail, the police thought that for some reason these CO2 BB guns where being illegally imported into Canada and could be somehow converted into real working AK-47's. The police even believed that people like myself who owned and sold them had some sort of underground conversion operation going on? All of this make believe nonsense sent the RCMP down a path that led to over a dozen Airgun resellers like myself getting a visit from their local SWAT detachment, getting arrested, and spending some time at police HQ trying to figure out what in the world we where being arrested for? This all took place in October of 2011. To give you an idea of the extent of the raid, there where at least 40-50 police officers at my house, police cars lined up down the street, SWAT members clearing rooms, a team of police going through all my personal belongings gathering guns, computers, network gear, cameras, drives and other evidence. I can not even imagine how much this would have cost Canadian tax payers just at my house alone never mind the other dozen or so simultaneous raids going on? What makes all of this so silly is that the CO2 BB AK-47's in question where legally imported into Canada with the CBSA's seal of approval and to top it off the company that imported them was the same company that also sold the police their real firearms. You would think the police would have done a little bit of research checking into the background of where these AK-47 CO2 BB Rifles came from instead of jumping headlong into a very costly sting operation that did not even include a visit to the warehouse that imported them into Canada legally in the first place. Even though I was arrested I was never charged with anything since the police quickly realized the error in their assumption. But still the police confiscated all my guns, my firearms license, my computers, my network gear, my hard drives, cameras and memory cards and kept all of it for a over a month. Perhaps next time they could of just asked a few resellers where they got their guns from rather than causing a huge disruption in peoples lives and business. The icing on the cake is that these scary CO2 BB AK-47's could not be converted to fire live ammo but even still the RCMP declared them "prohibited" and went about tracking down as many buyers and owners as they could and confiscating their BB guns without any sort of compensation to the owners who bought them legally. No accountability was ever put on the CBSA who allowed them to be imported in the first place and no compensation has ever been paid out to the law abiding Canadians who spent their hard earned money on these BB guns (about $300-$400 each). Anyways, I tell this story not to get people riled up and mad at the RCMP and/or CBSA, most of these folks are very good people with good intentions. After all, everyone makes mistakes from time to time. My problem is that my kids watched me get arrested and hand cuffed, yet I had done nothing wrong. At no point in time did the police give me any kind of apology or send some one over to talk to my kids and let them know that their Daddy was not a bad person and that it was all just a big misunderstanding? I hope that whoever masterminded this so called sting operation got some sort of reprimand since it would of cost Canadian tax payers a boat load of money just to get a bunch of BB guns off the streets! Why Would You Want a Blank Gun? What is a Blank Gun? The best way to describe a Blank Gun is to imagine it as a real gun in just about every way except one… There are no dangerous bullets flying out the front of it. That’s right, a Blank Gun just like a real gun uses a brass or metal shells, loaded with a primer and gun powder, but for what ever reason reason, some rocket scientists forgot to put a bullet at the end of the Blank shell. One way to look at a Blank Gun is to imagine it as a cap gun, but for grown ups. Similar to how kids like to shoot their cap guns because they go bang and sparks and smoke fly out of them, Blank Guns do the same thing but on a much grander scale and in most cases they look and sound a lot more like a real gun than a cap gun does. So Blank Guns don’t actually do the main function of a real gun (that is to shoot a bullet), but they do look and sound the part of a gun. So how could this be of practical use to anyone? First off, have you ever heard of a Starter Pistol or a Flare Gun? 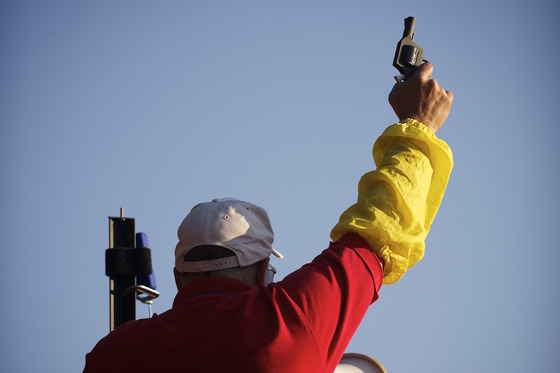 Blank Guns have been historically used to signal the start of races. Many Blank Guns also have the ability to shoot flares by adding a flare adaptor to them so a person can shoot a flare into the air to signal distress if they are lost or hurt. Since many Blank Guns look, operate and feel almost exactly like real guns, Blank Guns are a great place to start out when training a person on proper gun handling and operation. If they make a mistake while using a Blank Gun, the consequences are far less severe than with a real gun. There is also much less kick from a Blank Gun so shooting a Blank Gun is less scary or intimidating for new shooters. Dogs used for police, military and hunting are required to stay calm around loud noises like gun shots, trained dogs also need to get used to the presence of guns and even how to attack the gun hand of a person who could be a potential threat. Again using Blank Guns in this training situation is a much better option than using a real gun for obvious reasons. Many collectors want to own guns but for reasons like gun restrictions in their area, they may not be able to own a real gun or certain types of real guns. Blank Guns can offer a person with heavy gun restrictions in their area the ability to own similar Blank Gun versions. Perhaps they can own real guns but just simply don’t want to go through the licensing and registration hassle of owning a real gun. Blank Guns can generally be purchased for far less money than a real gun which is appealing to collectors who in many cases may not even shoot them. In places like Turkey, people celebrate holidays and events by shooting Blank Guns into the air, at one time they actually shoot real guns, but people where getting injured or even killed by the falling bullets. Because of this, Blank Gun production became an industry in places like Turkey as Blank Gun manufacturers like EKOL, Retay and Zoraki (also know as ATAK Arms) are Turkish companies. So now you know some of the reasons why a person would want to own a Blank Gun. I have Blank Guns and I also own real guns too. One reason is because there are many Blank Guns I own that I can not own in their real steel versions because of Canadian gun restrictions so obtaining a similar version in a Blank Gun allows me to own these models. If a Blank Gun is not for you, then by all means get a real gun, but please understand that there is a place for Blank Guns, and in those environments, a Blank Gun is actually a better choice than a real gun. 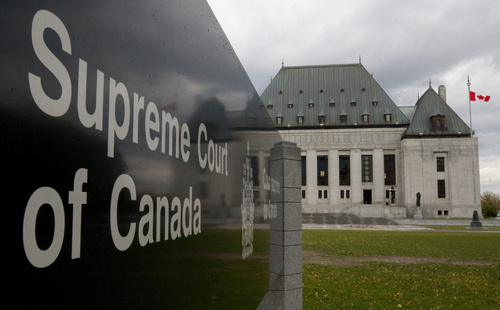 "On Wednesday, November 5, the Supreme Court of Canada issued its ruling R. v. Dunn, finding that most air guns are considered “firearms” for all purposes in the Criminal Code except for licensing and registration. As the Supreme Court has ruled on this issue, the only route forward is through legislative amendment. Canada’s National Firearms Association has been extremely active on this front and will continue to pressure the government and provide all assistance in order to see that this decision be responded to by Parliament." Canada’s National Firearms Association is this country’s largest and most effective advocacy organization representing the interests of firearms owners and users. 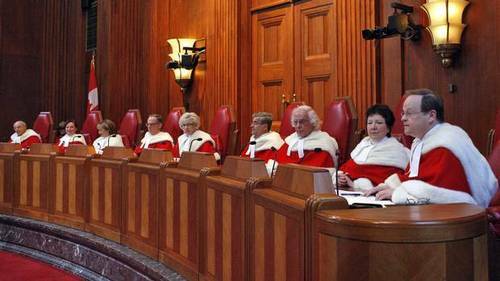 My big concern with this new Supreme Court of Canada ruling is that it really only effects law abiding Canadians. The criminals are not going to be worrying about how they store, transport and handle an airgun and since this new "airgun rule" does not change how an airgun can be purchased, or the fact that a criminal can still be charged with a gun crime while using an airgun in a crime, nothing has really changed by this new law from a criminals perspective. Even more disturbing is the fact that the vast majority of airgun owners are now criminals since most will not be storing their airguns in the same way a firearm needs to be stored. Most Airgun owners do not have a PAL Firearms license, so they will have no idea of this new airgun ruling or even be educated on firearms handling and regulations, making most airgun owners criminals because for the most part, they will be storing, transporting and handling airguns in an unlawful manner now according to this new airgun ruling. What is an Uncontrolled Firearm in Canada? This Article and Video expresses my views and opinions on this matter and should not be taken as legal advice. Uncontrolled Firearms do not require a Firearms License within Canada to own and operate. What is an Uncontrolled Airgun and Airsoft Gun? What is an Uncontrolled Blank Gun / Starter Pistols? What about Fully Automatic Airguns and Airsoft Guns? NOTE: Controlled Firearms require a POL (Possession Only License) , PAL (Possession Acquisition License) or R-PAL (Restricted Possession Acquisition License) within Canada to own and operate. Firearm – a barreled weapon from which any shot, bullet, or other projectile can be discharged and that is capable of causing serious bodily injury or death to a person, and includes any frame or receiver of such a barreled weapon and anything that can be adapted for use as a firearm. Flare, blank, rivet and industrial guns: Any device that is designed exclusively for signaling, for notifying of distress, or for firing blank cartridges or for firing stud cartridges, explosive-driven rivets or other industrial projectiles, provided that the importer intends to use it only for the purpose for which it is designed. Low muzzle velocity/energy guns: Any barreled weapon that is not designed or adapted to discharge projectiles at a muzzle velocity exceeding 152.4 meters per second (500 feet per second) and at a muzzle energy exceeding 5.7 Joules, or to discharge projectiles that are designed or adapted to attain a velocity exceeding 152.4 meters per second (500 feet per second) and an energy exceeding 5.7 Joules. Both thresholds of 152.4 mps and 5.7 Joules must be exceeded for the firearm to be considered “controlled”. This requirement exempts firearms that fire below the threshold velocity with a standard projectile, but exceed the threshold velocity when fired with a high-velocity projectile. Airsoft guns and certain types of paintball guns or markers may qualify as a replica firearm, if the muzzle velocity of the projectile does not cause serious bodily harm and their external features are clearly designed to resemble a specific and readily identifiable make and model of a firearm. To be considered a firearm, within the meaning of the Criminal Code, an airsoft gun must have a muzzle velocity in excess of 111.6 meters per second (366 feet per second). NOTE: This memorandum used to state when using a .20 gram BB but does not specify this BB weight anymore? NOTE: The term air gun is a colloquial term referring to BB or pellet guns. Such guns operate either as spring- powered, gas-powered, or electrically powered. If the muzzle velocity of the air gun is less than 152.4 mps (500 fps)/5.7 joules but still able to cause serious bodily injury to a person, it may be considered an “uncontrolled” firearm. Airsoft guns and certain types of paintball guns may qualify as a replica firearm (see paragraph 49 of this memorandum). “Replica firearm” is defined as any device that is designed or intended to exactly resemble, or to resemble with near precision, a firearm, and that itself is not a firearm, but does not include any such device that is designed or intended to exactly resemble, or to resemble with near precision, an antique firearm. (c) it cannot be designed or intended to exactly resemble, or to resemble with near precision, an antique firearm. These are air guns with both a high muzzle velocity (greater than 152.4 meters or 500 feet per second) and a high muzzle energy (greater than 5.7 joules or 4.2 foot-pounds). The "muzzle velocity" is the speed of a projectile at the instant it leaves the muzzle of a gun, normally expressed in meters per second or feet per second. The "muzzle energy" is the energy of a projectile at the instant it leaves the muzzle of a gun, expressed in joules or foot-pounds. 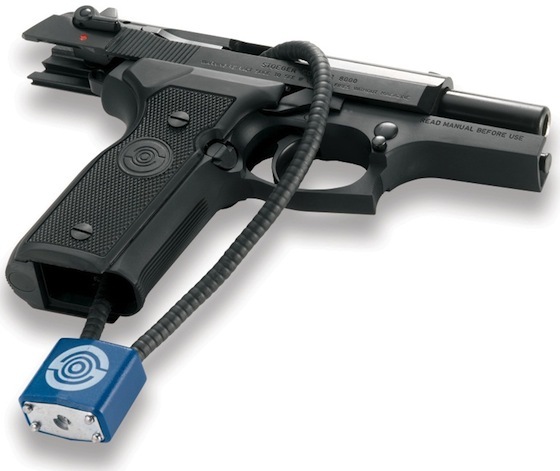 Air guns need to meet both standards to be classified as "Controlled" firearms for purposes of the Firearms Act. These high-powered air guns are subject to the same license and registration requirements as a conventional "Controlled" firearm. Owners and users are also required to store, transport, display and handle them safely in accordance with the regulations supporting the Firearms Act. Usually, the manufacturer's specifications are used to determine what muzzle velocity and muzzle energy an air gun was designed to have. This information may be available in the user's manual or on the manufacturer's website. If the information is not available, individuals can call the Royal Canadian Mounted Police Canadian Firearms Program (CFP) at 1-800-731-4000 and ask to speak to a firearm technician to find out if the air gun is considered to be a firearm for purposes of the Firearms Act. High-powered air rifles are generally classified as non-restricted firearms. However, the classification depends on the exact design of the air gun. Air rifles manufactured to resemble an assault rifle could be non-restricted, restricted or prohibited depending on the exact model imitated. High-powered air rifles would also be prohibited firearms if fully automatic or if they have a sawed-off barrel. They could also be restricted firearms if they have a folding stock that reduces the overall length to less than 660mm. 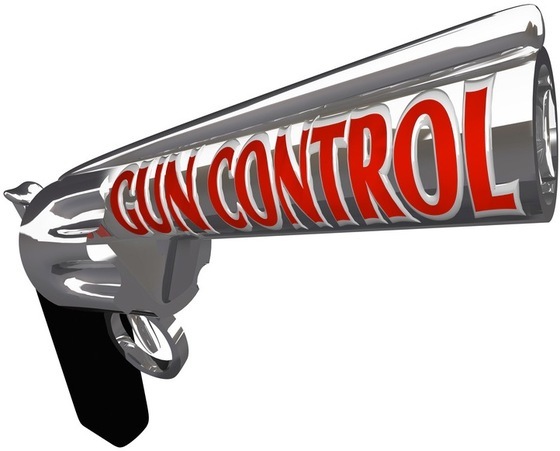 Additional thought on this subject: Even though Uncontrolled Firearms are not governed by the same laws that apply to Controlled Firearms within the Firearms act and do not need to be handled or stored similar in the same way you are required to handle, transport and store a Controlled Firearm, we need to treat our Uncontrolled Airguns, Airsoft Guns and Blank guns with care and go over and above what is expected when had handle, transport and store them. This YouTube video was made to touch upon the tragic shooting and death of a young man at the Beavercreek Walmart in the US. 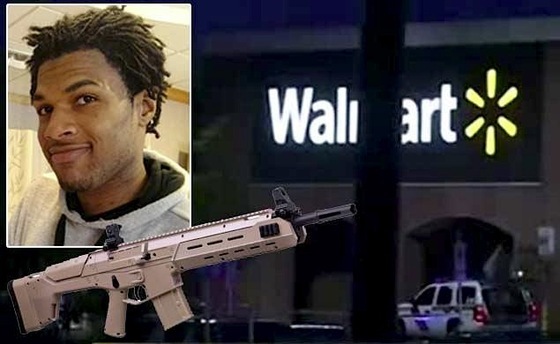 The tragedy was the result of poor judgment and misunderstanding of the situation that started with John Crawford (22) deciding to walk around a Walmart store with a very realistic looking replica Air Rifle. Subsequently in the midst of all the excitement as customers ran out of the store, Angela Williams (37) had a medical emergency that also cost her her life. 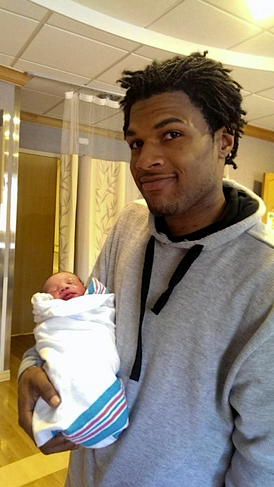 John Crawford 22 Years old was shot by police in a Beavercreek Walmart while holding a Crosman MK-177 Pellet BB gun. Another death as a result: Angela Williams, 37, was with her 9-year-old daughter and suffered a medical emergency and died as a result as people attempted to flee the store amongst the panic. 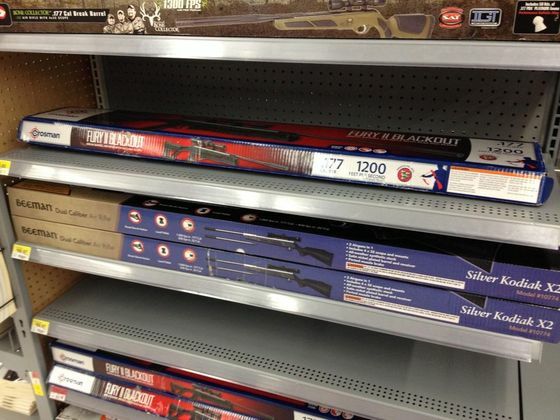 Walmart US keeps these guns on shelf in the box generally, but not locked up or behind glass. In Canada Most places keep even Airguns behind locked glass. The weapon (Crosman MK-177), which can shoot both pellets and BBs, had been removed from its original packaging, was this done by John Crawford or was it already unpackaged when he picked it up? Ronald Ritchie made the original 911 call, I listened to two of the police 911 phone call recording and he seemed to be talking level headed and not making it out to be anything more than what he saw which was a black man walking around a Walmart with what looked like a real rifle. John Crawford was holding the rifle while he had his phone between his shoulder and ear, John was fiddling with the rifle and looked to be trying to load it. Ronald Ritchie said John was periodically pointing it at people (which may or may not have been intentional). First and Foremost, this event is very tragic and my condolences go out to the families and friends of John Crawford and Angela Williams. Why was John Crawford walking around the Walmart with what looked like an "assault rifle" in a very public location? With all the public shootings these days, why would you walk around a public Walmart with what looks like a very real and threatening rifle, similar to the kinds used in these types of shootings in the past? Why did the police seem so quick to shoot John down? Where they a bit eager or hyped up? It would be very interesting to see the surveillance video for this tragedy? Why are very realistic Airguns on open display and so easy to attain? Keep in mind even a regular break barrel Airgun looks like a real rifle to most people. This will add "ammunition so to speak" for bureaucrats and authorities to question if Airguns should look realistic, or if they now need to have bright colored markings all over them so people will assume they are not reel? Or perhaps outlaw them completely or make them very hard to attain for the average person. Now the general public will have yet another reason to have a negative view on Airguns. I fear that putting more restrictions on airguns is just a stepping stone to more restrictions on real guns and more restrictions on our rights overall. Based on how easy it is for a person to get their hands on very realistic looking Airguns in most US based retail stores, I am surprised this tragedy has not happened already, or more often. Would you walk around your neighborhood with what looks like an Assault rifle? So why walk around a Walmart with one? We even need warning labels on our coffee telling us it's hot, or to not put poison in our mouths, there are railing and barriers around any bit of water or slight ledge. Society is programing people to think less fore themselves and trust that everything is going to be OK.
Well it's not true, there is still something called survival of the fittest no matter how many safety nest are in place. We need to spend more time teaching our kids how to act and behave and how to think for themselves and not be so dependent on everyone else to protect them from themselves. Don't leave it up to the TV, movies, video games or even their just as oblivious friends. Is an Airgun Good for Self Defense? Is an Airgun Good for Self Defense? Another one of those questions I get asked fairly often that's a bit hard to answer in a few sentences... Not all of us have easy access to a 9mm pistol or even a rifle but many of us can get our hands on an airgun fairly easily and they look real enough, I guess that is one thing they have going for them. 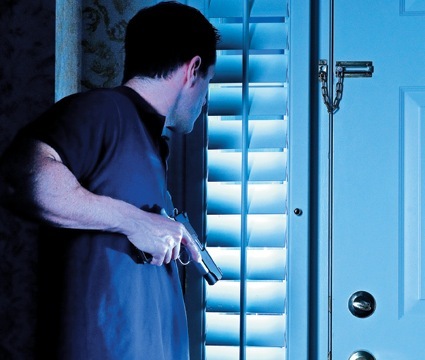 But what if the mere sight of what looks like a gun does not scare an intruder off? If you where hoping that would be enough, you may just be out of luck and what if you just brought an Airgun to a "real" gun fight? You are going to be drastically "outgunned" pun intended and here's why. A 4.5mm Steel BB weighs about 5.1 grains and generally you are looking at about 2-3 foot pounds of energy from a CO2 BB gun. Even a .177 caliber lead pellet is only marginally heavier at around 7-8 grains and if you're really lucky you might just get 4 foot pounds of energy out of a CO2 pellet pistol. 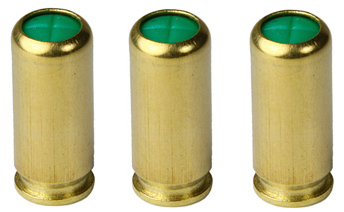 So let's take a look at a fairly conservative "real pistol" rounds, the 9mm. The 9mm rounds come in different bullet weighs but you can get a 120 grain 9mm in a plus p ammo with as much as 400 foot pounds of energy and even with that much raw power, many people claim that a 9mm round does not always have enough stopping power to put down a person even when shot multiple times center mass. It just depends what vital organs or arteries you hit that determines if he gets lucky or you get lucky. Your 5.1 grain 4.5mm Steel BB is not going to do anything if it hits any type of clothing and even if you find some flesh it's just going to piss off the intruder. My suggestion is to consider a bat or a golf club or a really big knife or just about anything other than an airgun because if the sight of the airgun replica does not scare an intrude away then you are really buggered. Keep in mind that you need to abide by any laws regarding the use of self defense in your areas. Even just physical force could be considered a crime and at the end of the day you are ultimately accountable for your actions. Will this Ammunition Work in my Gun - Can I Convert a Blank Gun to a Real Gun? Two questions that come up over and over again and to be honest I just hate answering, mainly because both of these questions to me are kind of common sense questions. I feel if someone where to stop and actually think about teh question, the answers would become obvious. Will this Ammunition Work in my Gun? Can I Convert a Blank Gun to a Real Gun? So that's pretty much it in a nutshell, watch my YouTube video below as I show you examples of ammo types with visuals on exactly why you need to use the ammo made for your gun. I also talk about the dangers of attempting to modify a blank gun to shoot some sort of real bullet and why it is a very bad idea in so many ways to try and convert a blank gun into a real gun. This means we will now be able to bring a lot more "All Metal Replica" Airsoft guns into Canada that where previously not allowed because of our much higher feet per second restrictions. 1. The purpose of this notice is to advise of changes affecting the classification of 6mm calibre airsoft guns. 2. 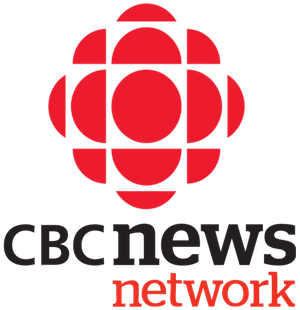 Section 2 of the Criminal Code defines a firearm as “a barrelled weapon from which any shot, bullet or other projectile can be discharged and that is capable of causing serious bodily injury or death to a person, and includes any frame or receiver of such a barrelled weapon, as well as anything that can be adapted for use as a firearm”. 3. As outlined in Memorandum D19-13-2, Importing and Exporting Firearms, Weapons and Devices, it was previously established that an airsoft gun, firing a .22g 6mm plastic pellet, must have a muzzle velocity in excess of 124 m/s (407 fps), in order to be considered a firearm. 4. Based on the latest research, it is now established that the muzzle velocity at which a .20g 6mm plastic airsoft projectile is capable of causing serious bodily injury is 111.6 m/s (366 fps). 5. Airsoft guns, firing a .20g 6mm plastic pellet, with a muzzle velocity above 111.6 m/s (366 fps), will be classified as firearms. Please refer to D19-13-2 for the import requirements of low muzzle velocity firearms, including low muzzle velocity “uncontrolled” firearms. 6. If an airsoft gun, firing a .20g 6mm plastic pellet, shoots below 111.6 m/s (366 fps), and resembles with near precision an existing make and model of a firearm, other than an antique firearm, it will be classified as replica firearm. Replica firearms are prohibited devices and must meet import requirements as listed in D19-13-2. 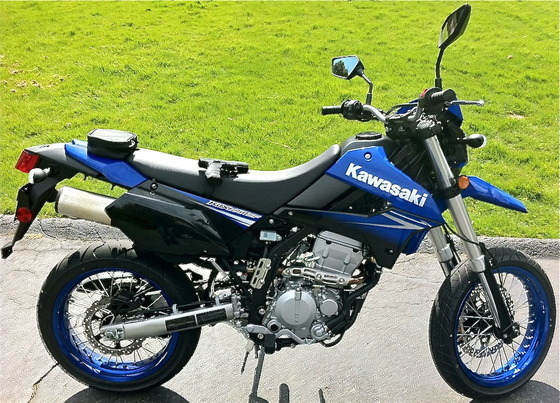 Here is the direct link to this Customs Notice 12-005 on the CBSA website! This may be "News" to some of my regular visitor but if this is your first time here, (perhaps after reading one of the CBC News article related to the imported BB shooting AK-47 airguns). I would like to welcome you to the Replica Airguns website. 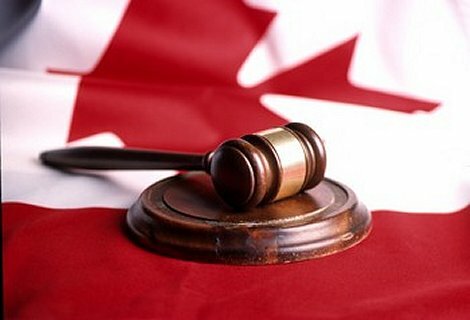 First off, Canada is still a somewhat free country and this gives us all the right to freely peruse our legal hobbies and passions even if they are not fully understood by others. For those of you that do not understand what this website is about, I respect that but I also want you to know that your opinion is not all that important to me and most of the people like me that enjoy collecting and shooting replica airguns and blanks guns. Owning guns in Canada is still our legal right and with this right comes great reasonability, just like driving a car or even drinking alcohol within ones limits. Yes people have died from gun related accidents, just like people have died from vehicles, alcohol, sports and many other mishaps that can happen to any one at any time each and every day. Life is precious and valuable and so are our rights. The guns sold on ReplicaAirguns.com, although they may look to some to be scary and dangerous, in reality they have a very small bite. In other words, the consequences of being shot with an air gun pail in comparison to being shot by a real gun and although people have died from airguns (usually thigh powered licensed versions not sold on this website), these instances are rare. Airguns must always be taken seriously and treated like any other gun, with respect! Air guns are one of the best ways to introduce a young person to gun safety. For the most part, it's not the educated gun people who cause the accidents, it's ignorance and stupidity and hiding your head in the sand that causes these accidents and deaths unnecessarily! My children are very young but I have already started to teach them how to respect all types of guns because one day when I am not around to tell them what to do, I know they are going to do the right thing and perhaps save the life of one of their "gun curious" friends who was "Sheltered" from guns and in so was never given the tools to treat them in a safe and respectful manor. So what brought us to this point? I am not going to say all that much because there is an ongoing investigation and I do not want to interfere with the RCMP investigation in any way. This incident has not effected the Replica Airguns Store operation as the warehouse that ships the products is still fully functioning and operating at 100%. All items sold at ReplciaAirguns.com are legal within Canada and are imported and sold legally at the time of their sale. Everything available in the Replica Airguns Store can be sold to an adult in Canada without the need for a special licence. Yes we perviously sold a legally imported BB shooting AK47 styled air gun that is now being investigated by the RCMP, as they have concerns about it being converted to a real firearm. If you have questions or concerns about the BB gun in question then you need to contact the RCMP and ask them your questions as I can not provide you with the answers. Was I raided? Yes I was, it was not fun. The police took all my stuff and it disrupted my life and my family, pretty much what you would expect from a police raid… At this time most of my personal airguns and blank guns have been returned to me. I am still waiting for my computer related items and registered firearms to be returned to me. I have not been charged with anything at this time and I do not believe I will be charged based on the findings and information provided to me by the police and the fact that I have not done anything wrong. I get a fair bit of interest and questions from people in the TV, Movie, Stage, Internet and Photo business looking for guns they can use in their productions, so I thought I would put together an informative video to show them some options available to them at least here in Canada. The problem is a lot of times a "Gun Handler" is required, as in many cases real firearms are used and very strict guidelines need to be in place for obvious safety reasons. This is most likely the best option in the case of a Matrix styled movie and an extensive amount of guns are required in the production. What if you only need a few guns and you want to keep your budget and complications to a minimum? Well there are other options and that's where I come in. Watch this short Promotional Video for more information if you are looking for a simplified and easy solution for your realistic gun use in Movie, Stage, Internet and Photo productions. OK, right off the bat the title for this post is a bit dramatic but if it gets me a few extra hits why not! So I went south across the boarder to pickup a few air guns supplied to me for review by UmarexUSA. Umarex is not comfortable sending airguns to me directly in Canada so I have Umarex send it to a place close to the boarder in Blaine that ships and receives items. Todays trip I was bringing back a couple air guns - the Umarex SG9000 BB Shotgun and the Umarex S&W M&P 45. Both of which shoot under 500 fps and have an energy value of less then 5.7 Joules which classifies them as Un-Controlled Firearms in Canada. And what does this mean? The short of it is that in Canada we are not allowed "Replica guns" and so there are some Police and Border Guards that believe any airgun that looks like a real gun is a "replica gun" and so it is illegal to own or import into Canada. It is kind of complicated but we have provision in our Canadian Firearms Act that addresses this issue but as I found out today, not all Border Guards are aware of this. Now I do not want to bad-mouth our Canadian Border Guards, for the most part they are very fair and they are just doing their job to the best of their ability. Here are the parts that are important to my story! A device that resembles a real firearm but cannot fire a projectile, or its projectile cannot cause serious bodily harm. Replica firearms are prohibited devices (most AEG's and GBB pistols). Prohibited devices are not the same things as prohibited firearms. A barrelled device firing a projectile able to cause serious bodily harm. For CBSA's purpose, all firearms are separated into either controlled firearms, or un-controlled firearms. (a) an air gun or BB/pellet gun that resembles a real make and model of a firearm may not be a replica firearm if it is an “uncontrolled” firearm (see “Uncontrolled” firearms). Sorry to make you read that but it is imperative to the rest of my story so that you understand that a Metal BB or Pellet gun that shoots under 500 fps with an energy level below 5.7 Joules is in fact an Un-Controlled Firearm or a barrelled device firing a projectile able to cause serious bodily harm and can in fact resemble a real make or model of firearm. Unfortunately I did not print off Memorandom D19-13-2 (Note to self... Print it off before heading across the boarder to pickup Air guns!). Now last time I had no problems at all bringing my Umarex PPQ across the border, I guess my Border Guard that time was on the up and up? Well this time I got sent right into the main building for "Question and Answer Time". They took a look at the air guns and came back and said, "I can't let you keep these airguns because they are Replica guns." So I said, "They are not Replicas, they are Un-Contorlled Firearms making them in fact not a Replica but an actual Firearm. So they said, "Our documentation says that any airgun that looks like a Firearm, is a Replica and we do not classify airguns as Firearms". So I said, "So all the places in Canada selling Replica Airguns are doing so illegally and if so, how are they getting all these guns past you guys?" We went back and forth on this for about a half an hour and I was not disrespectful to the Border Guard and he also took the time to hear me out. After he realized that I was more then just your average uninformed tourist returning from vacation with an airgun keepsake, he went into the back and returned to tell me he had good news. "You can keep your air guns" he said! He had spoken with another Border Guard who knew more about the Airgun - Replica laws and was set straight on the confusing matter. Yes it was a bit stressful at the time but I still have all my faith in our Border Guards, they where not in any way rude to me, but keep in mind I was not disrespectful to them either. It kind of makes you wonder how many fully legal airguns get confiscated at the border and more then likely destroyed? So anyways - the good news is I have two more Umarex products that I will be reviewing very soon. So make sure to checkout the Umarex SG9000 BB Shotgun and the Umarex S&W M&P 45 when I do their upcoming reviews. I had a little adventure today. 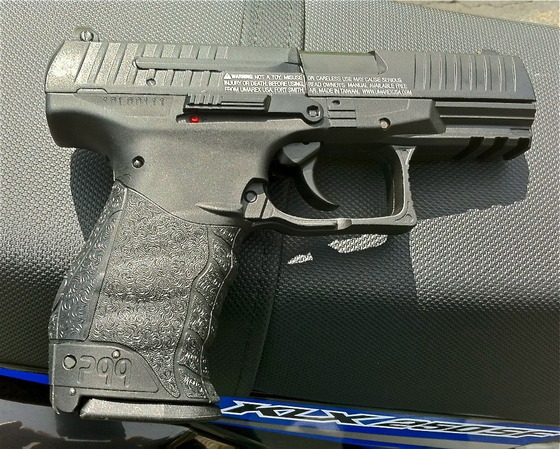 I needed to pick up an Umarex PPQ CO2 Pellet Pistol sent to me for review purposes by Umarex USA. The reason it was such an adventure was because Umarex USA was only able to send the PPQ Pellet Shooter to an address in the US and I live in Canada! No problem as I am very used to this No-Canada ship-to policy with many businesses. My work around is to ship to a warehouse in the US that specializes in shipping and receiving products for Canadians just like me. So I made it across into the US and picked up my PPQ, stuffed it in my backpack, grabbed some Mexican food for lunch (it's always way better in the US), went for a joy ride, and then we headed back to Canada with my airgun tucked away securely in my backpack. I know my airgun laws so I was not worried about crossing back into Canada, the worst that could happen at the boarder was getting pulled aside and asked to pay some duty and/or taxes. It was actually kind of funny because the boarder guard asked me to pull the gun out and hand it to him so he could check it out and make sure it wasn't a real gun or "Replica" non-shooting gun. As I put my hand in the bag I said "do you want me to hand it to you", I wanted to makes sure I had not misheard him, that would have been an uncomfortable situation all around! I was thinking the whole time "I wonder what the people behind me are thinking" as we pass back and forth what looks like a real hand gun and then I just drive off like nothing happened. Anyways, I have to say the Canadian boarder guards are generally really good about this kind of thing as long as you are honest with them and stay within the law of course. So now I have this rather nice little pellet shooting Walther PPQ Replica to review for you all tomorrow! Make sure to check out my review! I plan on doing a full review complete with Chronograph fps and an accuracy shooting tests. Is an Air Gun, Blank Gun, Airsoft gun a Firearm in Canada? Can you tell which one is "Real" and which one is an "Air Gun"? There seems to be a lot of confusion about what is a Firearm, especially in Canada because we have some confusing laws in this area. First off, I am not an expert on this and this article is just my own personal understanding of how this works so don't quote me on it! "A firearm is a device which projects either single or multiple projectiles at high velocity through a controlled explosion. The firing occurs by the gases produced through rapid, confined burning of a propellant. This process of rapid burning is technically known as deflagration. In older firearms, this propellant was typically black powder or cordite, but modern firearms use smokeless powder or other propellants. Most modern firearms (with the notable exception of smoothbore firearms) have rifled barrels to impart spin to the projectile for improved flight stability." So clearly this does not include air guns because no "burning explosion" is involved. "A barrelled weapon from which any shot, bullet or other projectile can be discharged and that is capable of causing serious bodily injury or death to a person, and includes: Any frame or receiver of such a barrelled weapon, as well as, anything that can be adapted for use as a firearm." Notice that Canada does not limit Firearms to only include weapons that use explosions to propel a projectile. So this means that Air guns are considered Firearms in Canada! Or does it? Air guns and other barreled weapons designed to have: A muzzle velocity of 152.4 meters per second or less and a muzzle energy of 5.7 joules or less. So this means Airguns that shoot under 500fps and have a muzzle energy of less than 5.7 joules or 4.2 foot pounds are considered "Uncontrolled Firearms" in Canada! This is good news because if you're 18 years old, you can walk into any sporting goods store and buy an air gun. You also do not have to abide by all the strict rules and regulations a "Controlled Firearm" must. Keep in mind that if you use an exempted "Uncontrolled Firearm" in a criminal or negligent manner then it will be considered just like a "Controlled Firearm" and your A$$ is going to jail! What about Blank Guns? It does mention in the exemptions that devices exclusively for firing blank cartridges and/or for signaling "Flare" are also exempt. 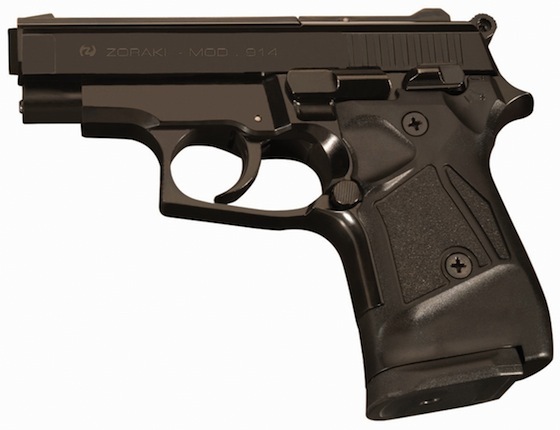 To be prohibited as a replica firearm, a device must closely resemble an existing make and model of firearm. If it looks like an antique firearm, as defined by the Criminal Code and Criminal Code Regulations, it is not prohibited. 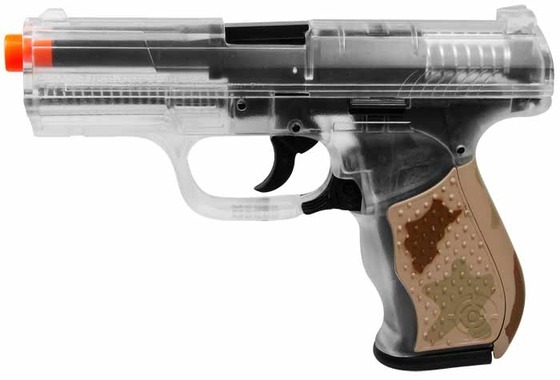 The Canadian Firearms Program receives many enquiries from people wondering whether an imitation firearm would be considered a replica if it resembles a real firearm in many ways, but it is made of clear or brightly coloured plastic, or is much smaller in size. Many of these devices need to be assessed case by case. As a general rule, however, those made out of clear plastic and those that are a lot smaller than the real firearm are not prohibited replicas. Those that are brightly coloured might be prohibited, depending on other features." Air Guns for the sake of the "Canadian Firearms Act" are considered Firearms in the first place and so they are real guns and can look like real guns, the exemption to this rule is based on the fact that they shoot under 500fps and have a muzzle energy of 4.2 foot pounds or less, not on what they look like. Blank Guns in Canada walk an even finer line. Basically, the ones that are being allowed into the Canada at this moment are classified as "Signal" or "Flare Guns" and they all come with flare adaptors. Secondly, they are not exact replicas of real guns in existence. If you have a blank gun that is the spitting image of a real gun and/or it does not have a flare adaptor and is capable of shooting flares then you have yourself a prohibited weapon which beleive it or not is governed even tighter than an actual restricted Firearm in Canada! The last thing I want to mention even though I don't really do the Airsoft stuff personally is: "what about Airsoft guns?" Many Airsoft Guns start out by not being classified as a Firearm because they are not capable of causing serious bodily injury or death to a person. So if they look like a real gun or are a replica of a real gun then they are considered Prohibited. To get around this law, most Airsoft guns in Canada have clear plastic sections and also come with red tipped barrels. There are however, some Airsoft guns that shoot a .20 gram BB over 366fps upgrading them so-to-speak into the same classification as a regular (Pellet/BB) Air Gun because the increased velocity makes them potentially capable of causing serious bodily injury or death to a person. These "high fps" Airsoft guns do not require clear plasitc parts or red tipped barrels. 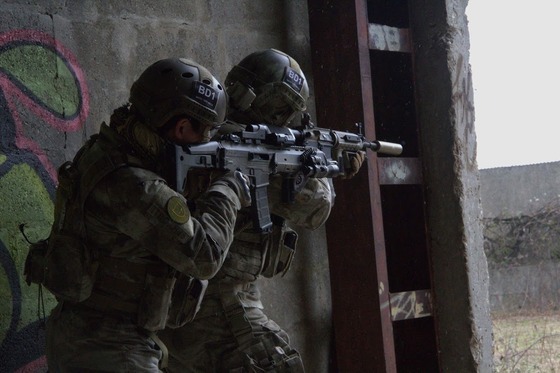 Here is a link to some more updated information specifically on the Airsoft subject. So now I have cleared this all up for you, or, you're just more confused then when you stated reading this article! Either way these are our Canadian Firearms laws as they pertain to Air Guns, Blank Guns and Airsoft Guns! "This article is only intended as a guide and may not be 100% accurate, please check your areas gun laws and regulations for more information on this subject." I want to talk about two very important Air Gun safety topics (Any gun for that matter). Those two topics are: Handling and Storing your guns. In Canada we are required by law to take a gun operation and safety course in order to get our PAL (Possessions and Acquisitions) license. A PAL license is required to purchase firearms and ammunition but is not necessary for most BB and Pellet guns that shoot under 500 fps. 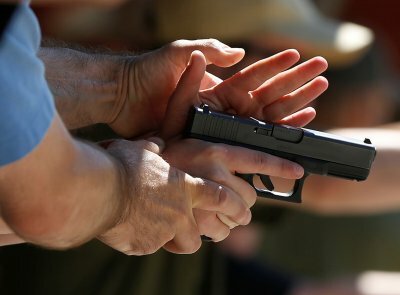 Personally, I think a firearms course is a great idea for anyone to take, even if you don't plan on getting a gun but you maybe have some interest or concerns about guns. The biggest problem with guns is the ignorance surrounding them. I'm not saying people who don't like guns are stupid, but rather that in many cases they simply don't understand guns and it scares them. What's even worse than this is when a firearms owner has no idea on how to properly handle and store their firearms. When you put both of these scenarios together you get a bad combination that in turn makes it more difficult for pro-gun and anti-gun advocates to see eye to eye. I definitely don't want to start a debate on this issue but rather provide safety information for those choosing to own and operate guns. Make sure you understand your areas gun handling laws. Get familiar with your gun while it is unloaded, read the owners manual, learn the workings and features of your gun until you are comfortable with it. If your gun has a safety make sure you know how to operate it but do not become dependent on the safety alone. 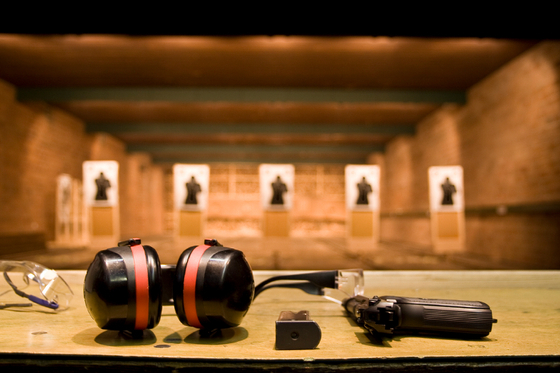 Always wear eye protection and if your gun is loud, use appropriate ear protection. Treat your gun likes it's loaded and off of safe mode at all times. The most dangerous gun is one that is believed to be unloaded. Many people treat unloaded guns with less respect than they do a loaded gun and pay a severe price for it when they find out the gun was actually loaded. Only place your finger on the trigger of the gun when you are ready to shoot at your target. 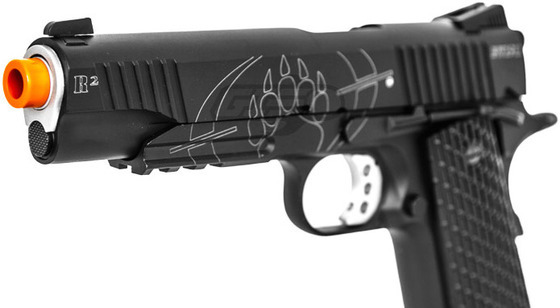 The best safety feature on any gun is your trigger finger. When you are not shooting, place your finger across the trigger guard, this acts as a physical barrier helping to protect the trigger from an accidental or unintentional misfire. If you are holding the gun but it is not in use, point it slightly forward but mostly toward the ground. When on a gun range, keep your gun pointed down-range in the direction of the target at all times. Always know what is behind and beyond your target and never shoot over the crest of a hill. Some ammunition can travel several miles and still be dangerous. Even a pellet or BB if shot upwards at a slight angle can travel a few hundred yard and impact a person with enough energy to inflict harm. Don't use your scope as a pair of binoculars to see what is out there. Use binoculars, that's what they are for. Would you like to be at the receiving end of a set of cross-hairs? When you are finished using your gun remove the ammunition, safety check and secure it. Make sure you understand your areas gun storage laws. In Canada most air guns that shoot under 500 fps are not required to abide by the same storage laws as licensed firearms but practicing safe gun storage for any gun is always a good idea. 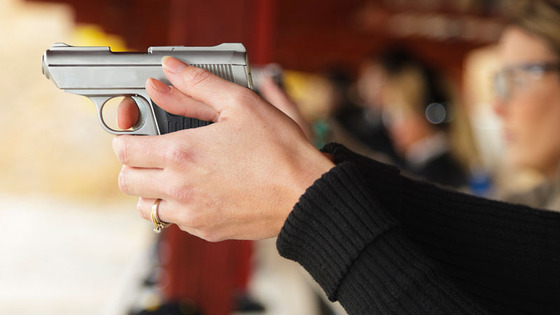 Safety check your gun - Make sure your gun is unloaded (visual inspection) before placing in storage. Make sure to have at least one level of lock prevention, this could be a gun safe or a gun trigger lock or cable lock. I recommend using a trigger lock on your gun and placing it in a gun safe. Keep your gun safe or case keys in a secure area out of sight. 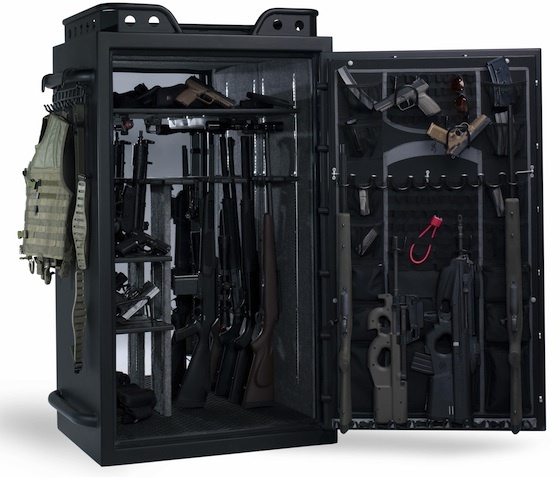 Keep your ammunition and firearms in different locations. This is not necessary in Canada but a good general idea. Keep your firearms out of sight and keep the temptation out of the picture. Gun storage laws when transporting your firearm are often different than when storing a gun in your home, make sure you understand these laws in your area. For example: In Canada we have to have an "ATT" transportation permit (Authorization to Transport) that allows a gun holder to transport their firearm from their home and to the range and/or to a gun smith. Any detours from point A to point B must be within reason. (No dropping by the bar on the way home from the gun range) Furthermore, licensed pistols must be unloaded and trigger locked in a hard shell case that also has a lock on it. Ammunition is not allowed in the case with the gun in transport and your gun needs to be in the trunk of your car or in an out of sight area if you have a truck. Hopefully you have gotten at least something out of this gun handling and storage awareness article. My hope is that many of you will take this to heart and if you don't already practice safe gun handling and storage, you will start today! Please feel free to spread the word and link to this Article and YouTube video on the same subject. I was kinda right about why the Zoraki Blank Guns are allowed in Canada. It's mainly because they do not closely resemble any existing model of Firearm making it a Non-Replica and a Non-Firearm. The issue with most blank shooters is that they are Replicas of existing guns. Here is the official statement I got from Vinzer Sports located in Chateauguay, Quebec Canada pertaining to what is a Firearm. Q. What is considered to be a firearm for purposes of the Firearms Act and for offences related to the Firearms Act in the Criminal Code? A barreled weapon from which any shot, bullet or other projectile can be discharged and that is capable of causing serious bodily injury or death to a person, and includes. Anything that can be adapted for use as a firearm. 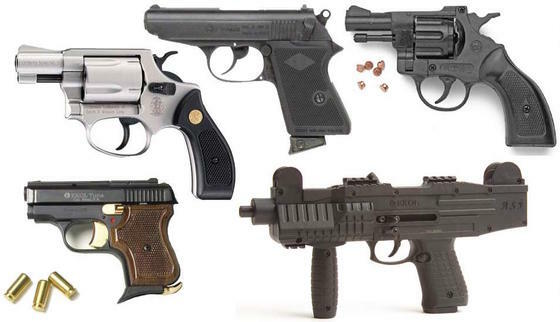 Following are some weapons and devices that meet the definition of a firearm but that are deemed not to be firearms for purposes of the Firearms Act and related offences in the Criminal Code. Some of these items are exempted from the definition only if they were designed exclusively for a specific purpose and are intended to be used exclusively for that purpose by the person who possesses it. However, all of the items listed below are considered to be firearms if used in a criminal or negligent manner. Devices designed exclusively for signaling, for notifying of distress, for firing blank cartridges, or for firing stud cartridges, explosive-driven rivets, or other industrial projectiles. I hope this helps anyone else who is interested in legally purchasing and owning a Blank Gun in Canada.